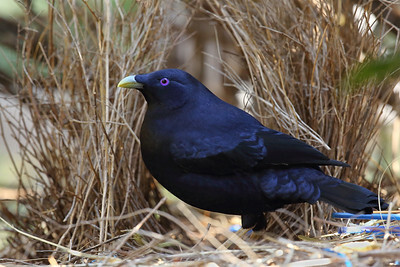 Mature male Satin Bowerbird (Ptilonorhynchus violaceus) endemic to eastern Australia. The male turns a bright blue colour after 5-7 years of age. This one was watching the Australian Brush Turkey eating a frog and then came down to collect any leftover food. Juvenile Satin Bowerbird liking to get its photo taken by me.